Can Lights And Shade Motors Be Controlled With Arduino & Vera? 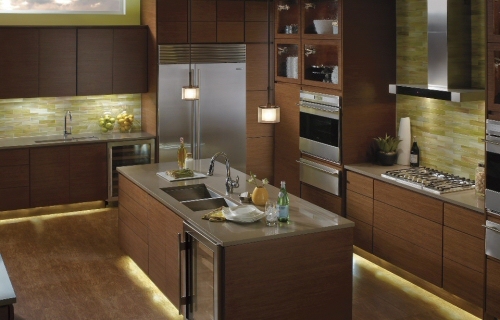 FAQ: Room lights & blinds - control both? Please Note: This page is here for legacy purposes only. This equipment has been replaced by our new educational ESP32 Micropython kit, with a programmable low voltage relay module that has almost unlimited capabilities. We now have an Arduino and Vera compatible LED companion controller (RollerNode™) for our radio equipped motors. An RF (Radio Frequency) signal is used for transmission of the remote control signal from our multi-channel hand held remotes. An Arduino microprocessor inside the RollerNode™ housing uses the decoded signals to activate the motor (and LED lighting). Our multi-channel remotes have up to 14 channels that can be programmed to control blind motors and other devices. The RF signal is also capable of passing through walls and in many cases can reach anywhere inside a typical home, and if you extend your system with Vera™ the possibilities are unlimited. Tired of 6 Different Remotes In Your Living room? We have heard many complaints about isolated, proprietary control technologies, and we too have had the experience of using numerous different remotes in our living room. The ability to interface our motors with the Vera™ web server (or any device with a USB port) takes you one giant step forward to having a single, unified control system for all your devices. The RollerTrol™ system has been designed from the ground up to eliminate this problem of multiple, isolated control systems. Available now, with our new Arduino compatible RollerNode™ LED lighting controller you'll be able to control LED lighting in various different rooms and hallways throughout the home, with the same remote that controls our radio motors. With the Vera™ control system, you can extend your system to work with phones, tablets, PC or any other web enabled device, whether at home or away (and continue using your original hand held remotes). The Vera™ system also supports Insteon™ , Z-Wave™, x10™ and other control systems. Using a high power concealed 12v LED spotlight (warm white), the picture above demonstrates this capability, highlighting a beautiful piece we picked up in Mexico. 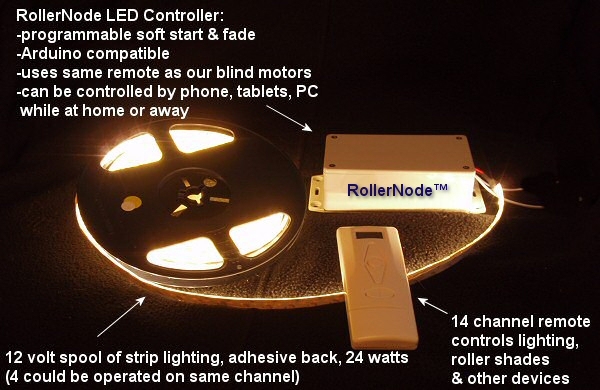 The picture below shows a 16' LED lighting strip controlled by the same remote used to control blind motors via another RollerNode™ Arduino compatible controller. Our new RollerNode™ add-on controller allows the remote control to operate 12v LED lighting. For instance, our standard 8 channel remote could be set up to control 6 blinds and 2 groups of room lighting. You can split this up any way you like. Our 14 channel remote provides even more flexibility. The soft, warm white color is easy on the eyes and the light is evenly distributed over a wide area, with no bright spots. You can also use spot lights or any other type of LED lighting, it doesn't have to be strip lighting (or use a combination of both). The LED strip lighting has an adhesive backing and can be concealed behind valances or custom moulding (see picture below) to create spectacular indirect lighting effects. If you have ever woken up to blinding lights, you'll appreciate how pleasant the controlled start or fade can be. 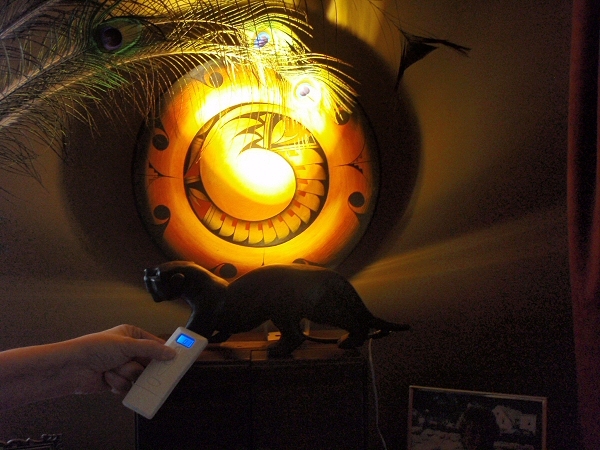 The RollerNode™ LED controller provides a pleasant 'soft start'; the light is smoothly increased to half or full brightness and when it's time for lights out, the program code inside the Arduino microprocessor fades the light down to dark. There are many other applications for the RollerNode™ system. For instance, we are often asked about using our motors for home theater systems. You can easily combine our radio motors with LED lighting to have a single button push (perhaps on your phone) that will deploy your blackout window blinds and projection screen, turn on the projector, adjust the screen borders for the proper aspect ratio, then do a slow theatrical fade of the room lighting as the picture appears. When you're finished, another button press reverses the process and presto, you've got your room back! The RollerNode™ LED controller comes pre-programmed, so if you like 'easy', you need to do nothing more except plug it in for normal operation, and you can stop reading right here ... but please continue reading if you would like to understand more about its capabilities. The Arduino system has taken the world by storm, providing sophisticated microprocessor control capabilities to non-technical artists and hobbyists. If you like to tinker, you can adjust the code on your PC with a simple text editor (or the free Arduino IDE software) and upload it to the controller via USB connection. It is very easy to do, and we encourage participation in this very practical open source microcontroller environment. Many consider the Arduino to be the most influential open-source hardware movement of its time. The first Arduino (Italian for 'good friend') was released in 2005 by a team of very clever instructors at the Interaction Design Institute Ivrea (IDII) in Italy. There are thousands of free code samples and project examples on the Internet, check out the main Arduino website. The pre-installed code for our soft start LED dimmer will be available from our website, so that you can to modify it to suit your own needs. The RollerNode™ motherboard has expansion capabilities, using the very compact Arduino compatible Nano v3 microprocessor board (designed by Gravitech USA), and there is a full breakout socket on our motherboard for those of you that want to add your own custom board. 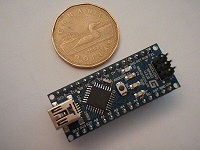 The amazing Nano board is a fully bootable computer with a built-in operating system, tiny solid state hard drive, system RAM, and a USB port. You get all this functionality in an easily concealed mountable housing (4.75" - 120 mm long) operating at 12 volts DC, at a very affordable price! If you feel really adventuresome, the RollerNode™ motherboard form factor has been designed to accept the Gravitech Nano add-on boards you'll see on their website. Want to make a tiny web server? Zigbee/Xbee wireless mesh network, anyone? An mp3 player? There are no limits to what you can do. The RollerNode™ housing itself also has captive slots to hold the boards in without any fastenings (115x32mm). It uses high integrity screw terminal blocks for connecting inputs/outputs and power. The housing has mounting flanges with extra slots for additional circuit boards (see RollerNode™ housing in top picture). There are 4 input/output terminal blocks for sensing or additional output, in addition to the 10 amp PWM output on the motherboard. The output transistors are rated at 75 amps; it is unlikely you'll have power issues within the 10 amp fused range. All of the Arduino ports are available for use at the Nano breakout socket header, so it is an excellent platform for developing your own prototypes. For instance, you could create a temperature sensing scenario simply by connecting a temperature sensitive resistor (thermistor) to one of the analog inputs of the Arduino Nano. You could monitor sunlight intensity or general light conditions by connecting an LDR (Light Dependent Resistor), also known as photo-resistor. There is also an 'auto-off' circuit that allows the Arduino to turn itself off after use, making it a very green product for low power energy conserving projects. Only the radio receiver stays alive, waiting for a command signal, consuming about 20 mA (or 0.03 mA on our low-standby version). The power handling capabilities are reasonably high (it also has reverse polarity protection), with an auto-reset fuse that activates at 11 amps. It automatically restores power when the current draw drops below 7 amps. When a radio command is received, the main board has power applied and the Nano is booted up, starting the LED fade up sequence. The microprocessor latches the power on by holding pin A0 high, then automatically kills power to itself and the motherboard after the 'off' command sequence is executed. You can also use a jumper to defeat the auto-off system if you need it to be constantly on. We are also producing a plug-in 'MiniMight' module option that adds motor control for items that don't have a built-in radio receiver, such as our 12v window openers. You can use this version to control two 12v reversible DC motors independently, up to about 2 amps total current (with brief peak bursts up to 6 amps). The motor control chip also has built-in thermal and overload protection. There is a jumper setting that allows you to combine both motor channels in parallel and operate it as a single controller for a larger motor. Each channel is driven by a PWM (pulse width modulation) output from the Arduino microprocessor for variable speed control. In the case of our fixed speed blind motors, a simple 'full on' signal is passed to the PWM output. The system also has additional program control over reversing and motor braking, with a low standby mode that can be enabled as a power saving measure when the motors are inactive. The optional MiniMight motor controller board for RollerNode™ can also be re-purposed and used to control other devices (such as relays) simply by connecting relays to the motor outputs. You can also alter the behavior of your controller by reprogramming the Arduino microprocessor with a simple upload via USB from a laptop or similar device. This will be covered in the advanced instructions for reprogramming the Arduino microcontroller. 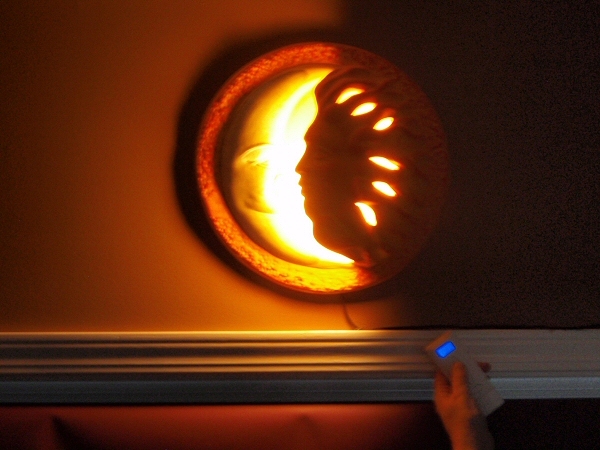 Here's our favourite wall fixture we picked up in Guadalajara controlled by the same remote used for window blinds. We sincerely hope you enjoy using these advanced control systems; if you have any questions, please feel free to contact us at any time!